What Is The Short Film Battle? This year I’m embarking on a film journey of discovery. Some friends and I have decided to write up a manifesto outlining a competition of film watching, in which we try to watch as many films as we can in a year, but only ones that we have never seen before. 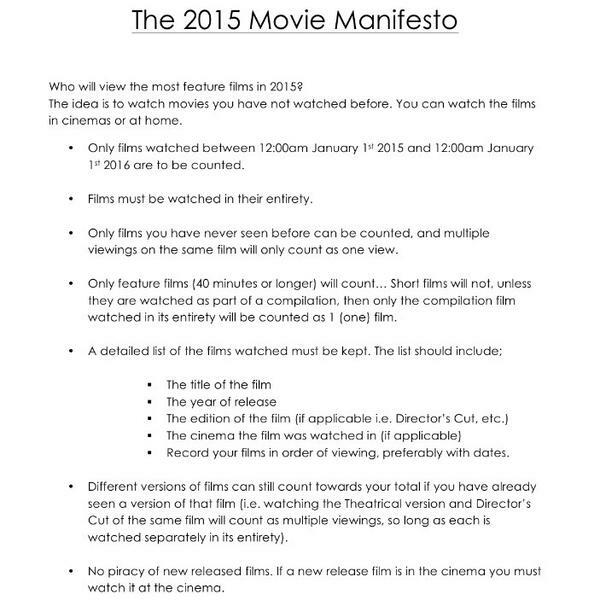 We decided to call it the 2015 Movie Manifesto. I have decided to go one step further though, and have given myself a goal of watching 365 films, as many films as there are days in this year. I’m off to a good start so far having watched 30 films in just 15 days, however I predict that it’s only going to get more difficult as the year goes on. Hopefully I can reach my goal, maybe even break it, but at the very least I want to see more films this year than anyone else I know. On top of watching films I’ve also decided to review every single film I see, but in only 140 characters. Andy Jones gave me the idea of using twitter as a platform to review films in a condensed format, one after the other, without having to worry about filming and editing myself talking about myself. So if you’d be interested in following my series of film reviews, please check me out over on twitter: @fazmotron . The Manifesto is right here if you’d like to participate, I look forward to hearing from anyone who does.